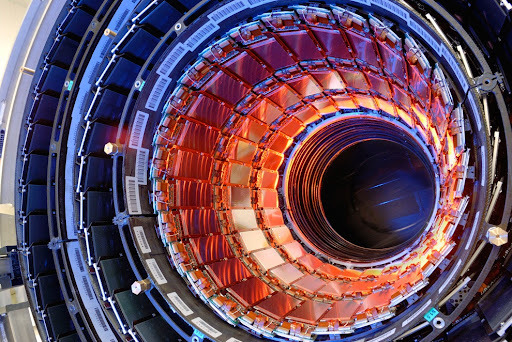 Imagine for a moment that scientists working 500 feet below the Franco-Swiss border got a little tipsy and loaded up the Large Hadron Collider with concentrated musicianship quarks, particles of perfect pop intuition and a brand new, multicolored pack of highlighters that was taken from the lab’s supply cabinet. Imagine that these punchy scientists then flipped the switch to “ON,” sending the three aforementioned types of matter careening toward one another at an energy of 7 teraelectronvolts. Somewhere inside the accelerator’s 17-mile, ring-shaped tube, there would be a dramatic collision. And, by my calculations, that collision would look and sound exactly like the video posted above. Shot in one take (!) in a brightly bedecked attic located in the band’s hometown of Boston, MA, this Love Drunk Studio-helmed performance video of “Yonkers” offers a wonderful glimpse of what makes Pretty & Nice so special. There is so much complexity involved in the music that P&N deploys, so many stops, starts and subtle variations, so much carefully conceived dissonance — the kind of stuff that makes you say to yourself, “Damn. There is a lot going on in there.” And all that intricacy in the hands of another group could easily fall apart, either because the parts are too difficult to perform consistently, or because the end result sounds more like an étude than a song, or because the group’s collective precision isn’t up to snuff. There are a zillion obstacles in the way of Pretty & Nice sounding as tight, as fluorescent (it’s amazing how bright their music sounds, despite the tension that runs throughout) and as pleasing as they do, which is why seeing them perform — in person or in a video like this one — leaves me feeling sublimely lucky. Lucky to be on the listening end of something so rare and packed with musical value, and lucky that the Large Hadron Collider hasn’t killed us all yet so I can hear more in the future (I couldn’t be more excited for their next album). The only stroke of bad luck in this scenario is that Pretty & Nice didn’t hit up the DC/VA area on their recent May mini tour. But as heartbroken as I am about that, I’m just as excited for you fine people to jump on the P&N bandwagon, so watch the “Yonkers” video above, listen to the song below and click here to snag the 7-inch single on which it appears.